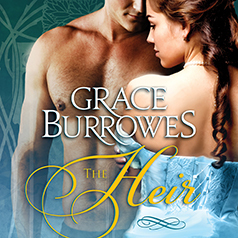 In this novel from bestselling author Grace Burrowes, the earl of Westhaven decides to spend the summer at his townhouse in London, where he finds himself intrigued by the secretive ways of his beautiful housekeeper. Contains mature themes. Gayle Windham, earl of Westhaven, is the first legitimate son and heir to the duke of Moreland. To escape his father's inexorable pressure to marry, he decides to spend the summer at his townhouse in London, where he finds himself intrigued by the secretive ways of his beautiful housekeeper . . .
Anna Seaton is a beautiful, talented, educated woman, which is why it is so puzzling to Gayle Windham that she works as his housekeeper. As the two draw closer and begin to lose their hearts to each other, Anna's secrets threaten to bring the earl's orderly life crashing down—and he doesn't know how he's going to protect her from the fallout . . .